Many people love Elvis but very few love Tendering! However Tendering is a skill and process which should be developed in every organisation. Public and private tender opportunities emerge every week to win new business so investing time and resources developing this skill will pay dividends overtime. Whether you are creating or responding to Pre-Qualification Questionnaires (PQQs), Invitation To Tender/Bid (ITT/ITB), RFx etc. ), the advice below will improve your Tender outcomes. 3. Qualify Opportunities – Create Go/No Go Bid Criteria for your company to use as a decision support tool to tender, or not. Rigorously quality each Tender opportunity to focus solely on winnable opportunities. Tendering is expensive to save time/money by learning to say ‘No’. 4. Tender Submission – Develop the core skills to produce best-in-class tender submissions, with a detailed Tender plan, win strategy, writing and reviewing task-list and submission check-list. 5. Post-Mortem – Tendering is a skill. Improve your strengths and learn from your mistakes overtime to continuously improve this skill and Return on Investment. Ensure to solicit, analyse and act upon all feedback (with further details below). 1. For each tender, define the bid strategy to position your bid ahead of the competition, exceeding the buyers’ stated and unstated needs. This bid strategy should summarise the proposal in a few keywords, prior to writing the narrative or incorrectly ‘copying & pasting’ from previous submissions. 2. The proposal needs to be about the Buyer so put their needs at the centre of the Tender document. Explain why your solution is ‘fit for purpose’, with a bespoke response in the buyer’s language. If you do not have a fundamental understanding of the buyer’s detailed requirements your chances of winning are low while avoid using generic/brochure material as the basis for your response. 3. Consider collaboration – be open to forming or joining a consortium to submit a collaborative Tender. Consider strategic partners for complex Tenders and undertake the necessary due diligence. 4. Utilise all available market research to determine the purpose of the tender, the decision-making process (especially award criteria), the incumbents strengths/weaknesses, the strategic ‘fit’ for your organisation etc. 5. A Tender is a project. Use all available company resources, expertise and tools to manage the project effectively with milestones, deliverables, tasks, owners etc. 6. A winning tender response should read like a good book, taking the evaluator on a compelling journey about your business, and how you are creating and delivering real value to your customers. This includes developing a consistent corporate style (grammar, font, colours etc) so as to construct clear and persuasive tenders and proposals. 7. KISS – Keep it short and simple. Use clear, jargon-free language, writing in easy to understand terms (with a list of abbreviations to assist the non-technical readers). Always, assume the tender evaluators know nothing about your company and your solution. 10. Consider presenting bids in bespoke tender-specific binders, with easily-navigable tabs and graphic design suited to both your branding and the requirements of the buyer. No matter how persuasive the written content, your document will lose impact without colour / design – every tender opportunity is also a sales opportunity! For example, Armand Hammer, former CEO of Occidental Petroleum, presented his winning bid for oil concessions from Libya in the mid-1960’s, in Arabic, written on a sheepskin parchment, rolled up and tied with ribbons bearing the Libyan national colors of red, green and black. This winning bid generated $200 million for Occidental in the late 1960’s. 11. Proofreading of proposals from start-to-finish is always a worthwhile task, especially experts not involved in the project including professional writers or editors. 12. When undertaking your post-mortem, consider your ‘win strategy’, market research and the effectiveness of your Tendering process. Consider the cost and time budgets, in relation to the value of the Tender. Whatever the outcome, use all available feedback to improve your next Tender. Any other Tendering tips from the trenches? support buyers through every stage of the Strategic Sourcing event. 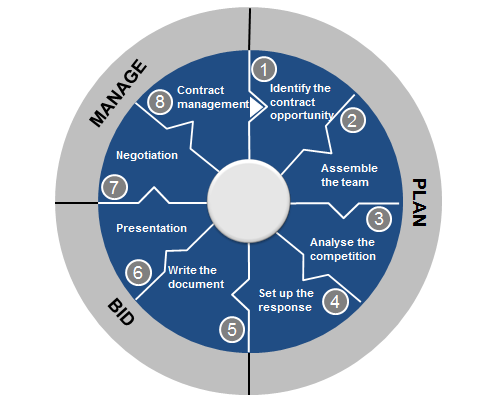 assist suppliers prepare, identify, qualify and respond professionally to appropriate bid opportunities. provide training to buyers and suppliers to maximise their success levels at either side of the Tender Document. Contact us today to discuss how we can maximise the return from your next Tender.